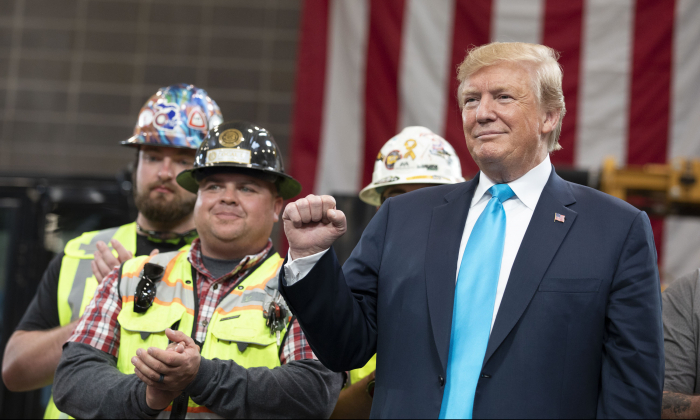 President Donald Trump’s 2020 presidential campaign reported raising more than $30 million in the first quarter of 2019, far outpacing the haul of every Democratic contender during the same period. The president’s campaign chest totaled $40.8 million in cash. Sen. Bernie Sanders (I-Vt.) and Sen. Kamala Harris (D-Calif.) led the Democratic field in campaign donations, raising $18.2 million and $12 million, respectively, in the first quarter. The average donation for the Trump campaign was $34.26; nearly 99 percent of the donors gave $200 or less. The average donation for Sanders’ campaign was $20 during the first quarter. The Republican National Committee (RNC) brought in $45.8 million in the first quarter. Trump’s re-election campaign is raising money alongside the RNC. Former Texas Rep. Beto O’Rourke and South Bend, Indiana, Mayor Pete Buttigieg ranked third and fourth in total campaign contributions in the first quarter, raising $9.4 million and $7 million, respectively. Buttigieg announced his candidacy on April 14, one day prior to the April 15 deadline for first-quarter campaign disclosures. Former Vice President Joe Biden leads the Democratic field in early polling, but hasn’t yet officially announced his candidacy or disclosed his fundraising figures. More than a dozen Democrats have announced their candidacy for the 2020 election. The party will begin the selection process for its candidate, starting with state-level contests early next year. In a race that is partly defined by fundraising prowess, other Democratic candidates are falling behind. During the first quarter, Sen. Elizabeth Warren of Massachusetts raised $6 million, while Sen. Amy Klobuchar of Minnesota and Sen. Cory Booker of New Jersey raised $5 million each. The Trump campaign has cast the 2020 election as a choice between socialism and freedom. The leading Democratic contenders have all endorsed the socialist Medicare for All and Green New Deal policies. The two policies would hand the government a monopoly over the energy and health care sectors and cost an estimated $125 trillion over the first decade. The total projected spending of the current government is $60 trillion in the next 10 years. The embrace of Medicare for All represents a hard-left shift for the Democratic party. Six years ago, the Medicare for All bill had no co-sponsors. Today, it is embraced by every leading Democrat running for president, one-third of Senate Democrats and two-thirds of House Democrats. While socialism is increasingly popular among younger Americans, only 18 percent of the overall population view the ideology in a positive light. Aware of the negative perception, all of the leading Democrats—with the exception of O’Rourke and Sanders—have steered clear of the socialist label. “They are playing a very delicate game because they have to appeal to their progressive socialist base, the people who get out and campaign for them, but they also don’t want to frighten middle America into the hands of the Republicans,” Trevor Loudon, an author who spent 30 years researching radical left, Marxist, and terrorist movements, said about the 2020 Democratic candidates.